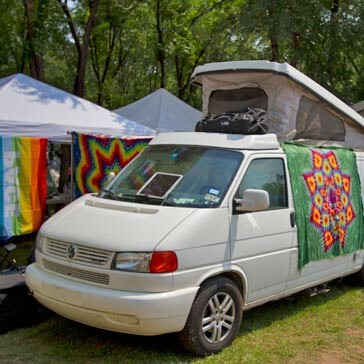 On-Site camping vehicle pass (up to 21' in length) for the 29th Annual Rocky Mountain Folks Festival. This pass allows a vehicle up to 21' in length into the south half of the On-Site Campground. A vehicle is considered anything that requires its own license plate. If you intend to have both a trailer and its tow vehicle in the campground, you must purchase 2 vehicle passes. This vehicle pass requires an On-Site Camping pass. Vehicle passes are sold *per-vehicle* not per site. This is an e-mail ticket, that will be e-mailed to you (unless you select "will-call"). This ticket WILL NOT BE MAILED. All Folks Festival tickets are refundable if returned on or before April 26, 2019. No refunds after April 26. The maximum quantity of this pass allowed per customer is 4.